Thank you SO very much for contacting us about sweet Catchy. We received a big response to the plea for his rescue and have gotten a commitment from a rescue group to take him & get him treated. We are PLEADING for help with those still at this horrible shelter, where they await their fate of death in the gas chamber, sadly many have the same story as Catchy...broken hearted and defeated. We are begging for their lives to be spared, but we MUST have rescue commitment for them and get them on transport Saturday night. Could you please take a look at the death row album? There are so many beautiful, sweet, precious animals needing to be saved. All dogs/pups come with at least $50 sponsorship and cats/kittens with $20 sponsorship. No pull fee for this shelter. Transport from NC traveling north on I-95 to NJ/NY/PA is also FREE to rescue. Hoping & praying for good news from you. We await your response. Thank you! Catchy is dying of a broken heart...literally. Not only did his owners dump him at a kill shelter that uses the gas chamber, but he is heartworm positive. 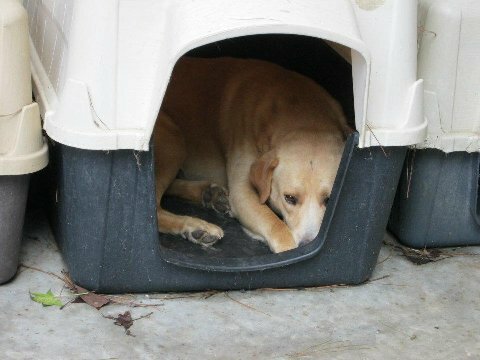 He was so depressed he wouldn't come out of his dog house at the shelter. Please help to mend his broken heart. Catchy (M) Yellow Lab 3-4 yrs. 50lbs. His owner didn’t want him anymore. We don’t know why as he is such a good boy. Free transport is available. Contact: MiddleMutts@aol.com to rescue this sweet boy!